what bits of you body are injured at this moment? Good idea, marred slightly by the glaring omission of 'Back', surely one of the biggest problems experienced by lots of people? Also, what about back-foot bunions, skin disorders and pterygiums? Broke my wrist in may that lead to ten weeks out of the water. Broke my finger at work yesterday so more time out. Shoulder and foot after going down the stairs on my arse. It was so hard not to swear my head off next to my 3 year old boy!! Stacked it on my skateboard doing a radical nose manual about 2 months ago. My knee still hurts, think I may have chipped a bone and its floating round in there as it hurts when I try to bend my leg behind my knee (really hard to pinpoint where the pain is coming from). Gotta go see the doc soon I think. Dislocating the bugger countless times dont help tho. So come on.....where this sympathy I was promised? Back here as well - for last 2 weeks plus. Had a tentative hour or so in the water Saturday and no niggles since. Might have to head over to my favourite North facing high tide spot after work. Back too, but that is from hours spent stripping old varnish from decking in back garden. Surely as back would be the common one, it would have made more sense for elbow and arm could logically be combined? My back is now killing me after sundays surfing. I couldn't make it in to work today. Its been giving me gyp for a few weeks but gave up the ghost on sunday. 2 sleepless nights since. Chris F wrote: Back too, but that is from hours spent stripping old varnish from decking in back garden. so maybe people can tick 'chest' for back problems? Poo Stance wrote: So come on.....where this sympathy I was promised? have some fluffy animals to make you feel better? 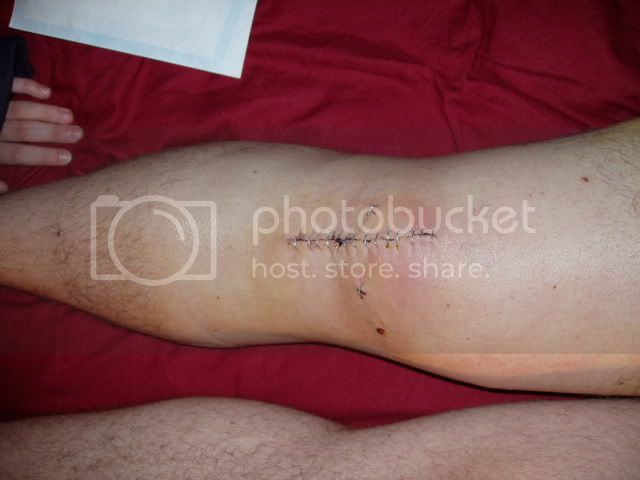 ACL reconstruction in my right knee circa 2001, never quite been the same since, but a big improvement on having a full rupture to the ACL. Good ol surfing injury! He lives in W.A. now, so I'm sure he won't mind me posting that! can't believe what a bunch of sick fookers you all are, am I the only one well and healthy with no bits that hurt, ache or are injured? how did you injure your right nut? Latest addition to the MSW hospital ward! Could see all the fat and gristle while I was in the water. Doctor said I wa lucky to miss the tendons. If we are going for pics, here is my knee post ACL reconstruction due to arial gone very wrong!